Yesterday I posted I was trying to use some new techniques for making maps and today I made a new map for an up-coming Tweak & Toss. That Tweak & Toss will probably be delayed a bit so I can make a few more maps and get the whole work-flow down as a new habit. It looks like these new techniques might allow me to make much larger (print-size) maps. My working size for this map was an unbelievable 36" by 48". Normally my computer would buckle under the strain of such a large map. The maps are PDFs......I don't try to do anything "fancy" with the PDF maps. I don't bother to fill out the properties tabs or make any of it a hotlink to this blog or my Patreon site. 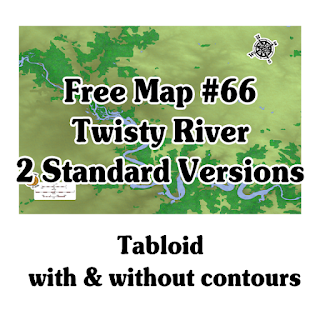 The free maps are just standard, tabloid (11" x 17") PDFs. My Patrons get high quality PDFs at both Tabloid and Arch D (24" x 36") sizes. 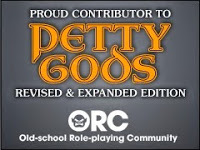 The Patron maps are also missing the Patreon "ad". 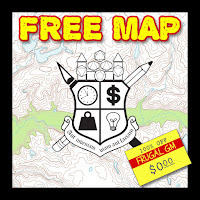 To get to the free map, click on either graphic in this post, or use this link.